We headed into Posto with our minds made up, knowing that nothing could top the four-meat ravioli in sage butter sauce. However, these gamey morsels were no longer starring on the menu, perhaps because they are a bit heavy for spring. With plenty to choose from at this Italian pre-theater haunt, we weren’t worried. After training your OpenTable trigger-finger to accurately discern Posto from Poste, make a reservation before seeing an artsy-fartsy performance at the Studio Theater right next door. Though the dining crowd is a little older than the typical 14th Street scene, the food is modern and they offer everything from pizza to branzino. It wasn’t until trying the Best Thing on the Menu: Molecche (corn meal flour-crusted soft shell crab) that we understood that soft shell crab is also eaten in Italy. The Venetians love to eat these critters just as much as the Japanese. Every inch of the crab is edible due to the fact that they have freshly molted their exoskeletons, leaving behind a soft exterior fit for consumption. This of course makes them a seasonal delicacy and in Italy, that season is April to September. 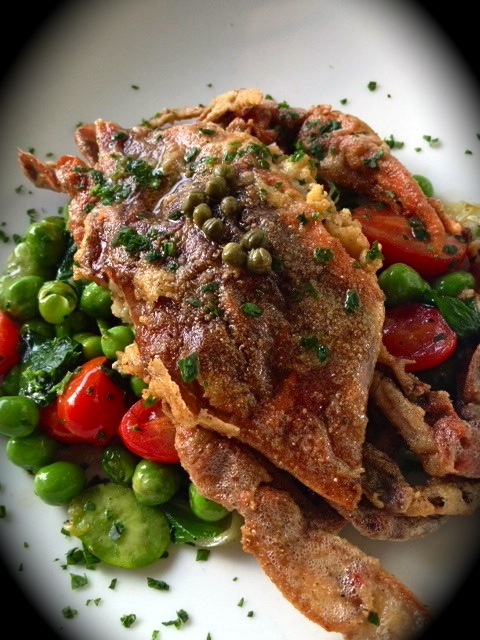 The BTM is perfectly accompanied by fava beans, cherry tomatoes, fennel, ramps and brown butter caper sauce. Heavy and light at the same time, this spring explosion is a great way to start your meal. Like Chef Bart Vandaele who we just chronicled, Posto’s Chef Massimo Fabbri from Monsummano Terme Italy also entered the culinary field at a young age. At age 14, he enrolled in hotel school and within a year, Massimo landed his first job in a high-end kitchen, working at the 4-star Parma & Oriente hotel. Molecche not your BTM? Post your favorites in the comments section. This entry was posted in Restaurants and tagged Best Thing on the Menu, BTM, Fava Beans, Massimo Fabbri, Molecche, Posto, Soft Shell Crab, Spring. Bookmark the permalink.